Earlier on the website, we profiled the major taxicab companies in HK from the 1920s to the 1960s. The late 1960s saw the dissolution of the large taxicab companies and the emergence of driver-owned taxis driven by regulatory changes and the proliferation of transportation vehicles such as minibuses and unlicensed cabs (also known as “white plate cars”) to meet the excess transportation demand of the growing population and in the early 1970s, a category of hire cars known as “public cars” were popular on the roads of HK with numbers rivaling that of taxis as the pricing (usually fixed and cheaper since its fare was not regulated) and the quality of their drivers, cars (usually air conditioned while not all cabs had that back then) and services (usually available at longer hours) tended to be better than taxis. A distant ancestor of Uber, public cars could only be hired by calling radio centers and were not allowed to ply for passengers on the streets or in taxi stands the same fashion as taxis (public cars which operated illegally as taxis had their licenses revoked or were fined). They also did not have pricing meters and taxi light on the roof but were differentiated by red color license plates with white fonts (which is why they were also known as “red plate cars”) and the large players painted their fleets a certain color with logos on the car doors. The government issued licenses for public cars to restrict its growth but nevertheless the number of registered public cars in HK went from 846 in 1970 to in 1055 in 1972 to 1322 in 1976 and were carrying 47000 passengers daily. 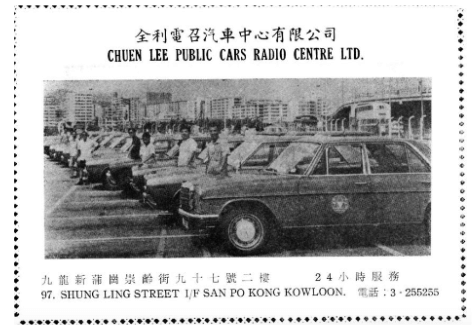 Chue Lee Public Cars Radio Centre was incorporated in January 1972 and had a fleet of over 80 public cars. Its chairman was Chow Ka-chuen (周家全) which is presumably whom the firm was named after although little info is available about him. As a firm, Chuen Lee Public Cars was dissolved in 1993 but it was likely succeeded by Chuen Lee Radio Taxi Association (全利電召的士聯會) which was incorporated in 1977 after the legislation permitting conversion of public cars to taxis came into effect. Founded in May 1971, United Radio Car Service Centre (hereafter refer to as “United Centre”) claim to be the first public cars company in Hong Kong. Its managing director Ho Ying-kan (何英勤) had over two decades of private hire car experience prior to founding United and visited foreign markets such as Japan to learn about the latest trends in transportation. He was particularly keen on community service – having conducted three charity ride fundraisers in 1971-72 – first one a 3 days campaign in May 1971 for Community Chest, second one in February 1972 also for Community Chest which raised $12000 and third one in June 1972 which raised $11170 for the rain disaster relief organized by TVB. In 1972, the firm had 150 public cars (with plans to add another 50 within the year) and boasted about its extended hours from 7am to 2am and 6 telephone operators (one of its numbers was 64111). As a firm, United Centre was incorporated in February 1972 and dissolved in 2001. Wing Lee was the largest of the three public car operators covered in this article with over 200 cars at launch and its founder Cheung Kung-wing (張恭榮, 1926-2005) was also a pioneer in paging service in HK and taxi and minibus service in New Territories. A native of Tat-Ho in Swatow, Cheung Kung-wing was born and grew up in HK. His father was a Nam Pak Hong merchant while his older brother Cheung Kung-leung (張恭良, 1902-1995) was a medical graduate from HKU (MBBS, 1933) and a prominent Western doctor and venereal disease expert in Swatow and Hong Kong (registered to practice in 1932). When he was 15, his father passed away and his older brother sent him to Shanghai to further his studies. Unfortunately, his education was interrupted by the Japanese occupation and he moved inland where he worked as a waiter for the US air force in Kweilin and a KMT soldier in Hunan and was trained as a paratrooper in Kunming. After the War, he worked as a sailor for 2 years during which he was first exposed to radio communication. 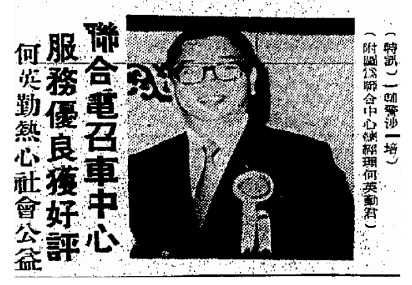 After he returned to HK, he was placed in charge of Leung Fong Medicine Company (良豐藥房), a pharmacy started by his older brother at 10 On Lan Street in Central while at night he studied telecommunications at a vocational school, graduating in 1948. Leung Fong made a lot of money shipping medical supplies to the mainland during the Korean War embargo in the early 1950s but incurred significant losses when one of its shipments was confiscated (as a firm it was incorporated in 1952 and dissolved in 1954). After the failure of the pharmacy business, he became a sailor again in 1955 working for an American firm during which he improved his English and telecommunications skills. In 1959, Cheung Kung-wing returned to HK and joined the GM and Oldsmobile distributor Triangle Motors (acquired by Dah Chong Hong in 1962, to be covered). Started out as a security guard for its auto parts warehouse, he rose to become deputy sales manager by 1965 through hard work and being street smart. Having a front row seat to the exploding growth of transportation demand in HK, Cheung became a partner of Lee On N.T. Taxi Co (利安的士), which was formed in 1961 by Lee On (who somehow was endorsed by Earl Mountbatten of Burma in his application to the Police Commissioner, who had the authority to grant taxi licenses at the time) to provide taxicab service in the New Territories. By the mid-1960s, Lee On with Cheung as managing director had 36 nine-seater taxis (precursor of the 14-seat minibus today) and 12 four-seater taxis and Cheung served as chairman of the New Territories Taxi Association (新界的士商會) and the HK, Kowloon & N.T. Public Light Bus Association. With his background in telecommunications, Cheung was drawn to the concept of radio public cars and incorporated Wing Lee Public Cars in March 1971 and launched its service in February 1972 . He was supported at Wing Lee by director Augustine Chung Sai-kit (a high-profile lawyer in the transportation field and son in law of Buddhist leader and real estate developer Wong Wan-tin) and manager Fong Bing-sum. The firm had somewhere between 150 and 200 cars and their phone numbers were 317755, 307703 and 318855. Like its peers United and Chuen Lee, it participated in the charity ride fundraiser in June 1972 and raised over HK$16,000. 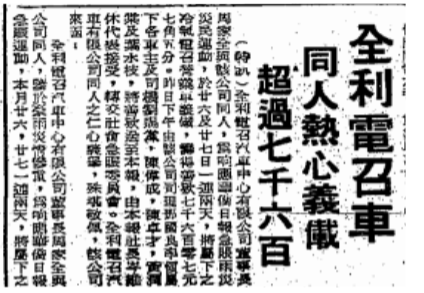 There was also an effort to establish a trade organization for public cars operators in HK with Cheung taking the lead. 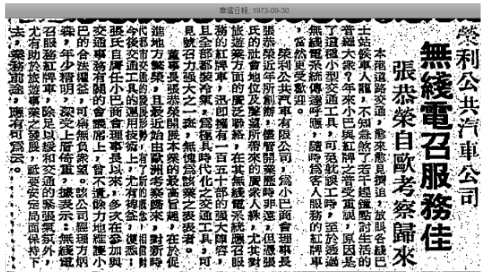 In 1974, Wing Lee Public Cars invested several millions HK dollars to establish Telecom Services Ltd (電訊服務有限公司), one of the first paging operators in Hong Kong and Macau. Allegedly Cheung Kung-wing developed his own pagers with the help of a Japanese friend and installed paging signal stations on the roof of 70 buildings across HK to build his initial network. With the assistance of his wife Pin Tsip-yan (卞接恩, former nurse) and their four sons – Alex Cheung King-shek (張敬石, MBA from University of Melbourne), Cheung King-shan (張敬山, studied in Canada), Bobby Cheung King-chuen (張敬川, studied in the UK) and Sunny Cheung King-fung (張敬峰, studied in the UK), Telecom Services became the fifth largest paging operator in HK by the early 1990s (behind Hutchison, ABC, Star and HKT) and evolved into the listed Telecom Digital Holdings (電訊數碼控股) which is currently one of the largest cellphone distributors in HK with over 70 outlets and over HK$1 billion in revenues. Wing Lee Public Cars is still a live company and business extended to bus services between HK and Shenzhen in the 1980s although transportation has become a smaller part of the family business relative to telecom and securities. Cheung Kung-wing and his older brother were big benefactors in their native Swatow while his four sons are also known for owning at least 6 racehorses with “Telecom” in its names. This article was first posted on 15th April 2019.